Netflix, which reports earnings late Monday, has fund managers at odds over where the stock could trade over the next six months following rate hikes to its service. BOSTON (TheStreet) -- When chit chat over a poker game last week turned to Netflix's (NLFX decision to raise prices for its DVD-delivery and Internet-streaming services, Darren Chervitz, director of research for Jacob Asset Management, became very nervous. Everyone at the table planned to change part of their subscription to Netflix's service, Chervitz says. Some planned to drop delivery of DVDs and Blu-Ray discs, while others complained that the quality of the streaming content wasn't worth the increased price. As his firm is an investor in Netflix, it was not what Chervitz wanted to hear. "Anecdotally, it's got me worried," Chervitz says. "This is a pretty significant change. Are they really going to be able to make this stick? The stock is expensive right now, so a misstep will not be taken lightly by the Street." Earlier this month, Netflix announced it would split its DVD and streaming services into two separate memberships. Users who currently have unlimited DVD rentals (one at a time) and access to streaming content will have to pay $16 per month to continue receiving access to both. This compares with the original price of $9.99. Current subscribers upset with the increase took to the Internet to vent their rage; "Dear Netflix" became a trending topic on Twitter as users blasted the company for the increase. "This is a pretty significant change," Chervitz says of the price changes. "I'm not going to overstate it because I've seen this kind of customer reaction, although it may not be as vociferous. But every time they've changed prices, they've gotten an outpouring of customer complaints. It may be bigger this time because of social media." With ownership of only 4,500 shares as of March 31, Netflix represents a small 2.3% weighting in the $45 million Jacob Internet Fund ( JAMF. Chervitz says the fund has trimmed the position significantly after the stock rose into the upper $200 range, although his firm hasn't altered its position since the pricing announcement. Chervitz does question the timing of such an increase, given the competitive heat from other players entering the content-delivery market. Reports last week said Apple ( AAPL - Get Report) was considering a bid for Netflix rival Hulu, which offers subscribers access to a digital streaming library of TV shows and movies. "I wonder why they're doing this at a time when competition is starting to get more aggressive," Chervitz says of Netflix's decision. "Is this the right time to be mucking around with your pricing plans when I'm sure Amazon ( AMZN and Apple could get more aggressive?" Chervitz does give Netflix's management team, led by CEO Reed Hastings, the benefit of the doubt, saying the service is still a good deal compared with most other entertainment options. "People can complain about $16 per month, but I'm paying well over $150 for cable," Chervitz says. "On some levels, it is silly. You have to trust management a little since they've made decisions in the past they have been very successful." 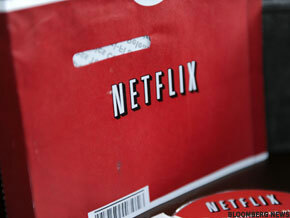 Other investors in Netflix are taking the price-hike in stride. While the price increase took him by surprise, Herb Chen, manager of the Huntington Growth Fund ( HGWIX, echoes Chervitz's view that management knows what it is doing. "Management has been intelligent enough to this point. I'm in the camp that this will work out to their benefit," Chen says. "This will be a push toward streaming video, which is where the future lies. We'll look back in two or three years and realize they had it exactly right and they knew what they were doing." Chen notes that as recently as a year ago the company was primarily known as a DVD-by-mail company. Now the company's Internet-streaming service is its calling card. "That's where the margins will be," Chen says. "In the overall run, this is the direction they want to head in. That's what is dictating the new pricing structure." Netflix, which reports quarterly results after the closing bell Monday, has seen gross margins improve from 33.3% in 2008 to above 37% last year. Subscriber growth is another reason Chen is a fan of Netflix. Net subscriber additions year over year have slowed in the last three quarters, although total subscribers are up 63% from a year ago as of the first quarter. Netflix is the eighth largest equity position in the $140 million Huntington Growth Fund, representing a 2.3% position as of June 30. Chen is also bullish on Netflix's decision to expand geographically outside of the U.S.
"They haven't grown geographically to the point that they can fully, so they're still in the infancy stage of their life cycle," Chen says.